It’s turned out to be so much fun, I wanted to tell you about it. But a compelling, memorable story can come from any kind of organization, of any size, from anywhere. So on Business Talks, we talk with business leaders of all types. In less than two months, for our once-a-week show, we’ve hosted, scheduled, or are in the process of scheduling: founders of businesses large and small, CEOs, marketing and sales people, a finance analyst, an online retailer, representatives of international corporations, non-profits, an agricultural entrepreneur, leaders of business groups, deans of business schools, the Mayor, the Congressman, the Congresswoman, the Sheriff, the Air Force. It’s exciting. Note: Audio to all our past programs is posted to the Business Talks website. The process of broadcasting requires some technical chops, but not as much as you might think—considering we broadcast live each week from a noisy restaurant. We get great support from the radio station. A college student engineers the broadcast as part of his studies. He runs the program like clockwork. (If Andy Cook doesn’t get an A, grades have no meaning.) We also have an intern who seems to know all about anything with a wire or a circuit, and takes great photos. Thank you, Andy Mendoza. Here’s the hard part: Your host must come prepared, think quickly, have a good background in the subject area and speak well. We’ve got that covered with co-hosts Tom McArthur and Kent Adams, the guys who invited me onto the project. At times, there’s a gap between (a) what guests say when they passionately talk about their business, and (b) what you might learn from their more standard marketing communications. I’m sure this is because most organizations don’t spend enough time refining their story. So the stories don’t seem as strong in their marketing materials as they are in reality. Or during a radio discussion. A marketer must listen to a company’s story from a variety of perspectives, then refine it until it makes the biggest emotional impact. I hope our guests, many of whom have not been on radio before, start to think more strategically about their story. 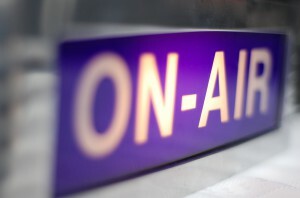 Would your business benefit from having a radio show? Sure, you could create a podcast series. But if you’re going that far, you’re not far from being in the radio business. Can you imagine a Gini Dietrich show on strategic marketing? Bill Dorman on insurance? Ralph Dopping on architecture and design? Danny Brown on social media? A lot of radio stations are desperate for content. Radio interviews can be repurposed in a variety of ways—at Business Talks, we’re just scratching the surface. Think about it. And share your thoughts below. This entry was posted in Communication strategy, Creative work, Inbound marketing by barrett. Bookmark the permalink.